At Northern Basement Systems, we specialize in preventing these problems with our patented crawl space dehumidifier and ventilation fan. As part of our complete crawl space encapsulation system, these products will ensure that your home has clean, dry air and help protect your crawl space from mold and other damage. If you've had issues with mold, wood rot, or other crawl space humidity problems, call us today at 1-855-248-5226 or contact us online to learn more about how we can help! We offer free estimates on all our work in Keene, Burlington, Colchester and throughout the surrounding areas in Vermont and New Hampshire. At Northern Basement Systems, we solve these problems with our crawl space encapsulation system and crawl space dehumidifiers. By sealing your crawl space off from the outside, we can create an environment that remains dry, clean, and healthy, as well as far more energy efficient. If you've had issues with mold, wood rot, or rising utility costs, the experts at Northern Basement Systems can provide you with a quality solution. We specialize in crawl space repair and encapsulation, and we know what it takes to prevent humid air and excess moisture from damaging your home. Call us today at 1-855-248-5226 or contact us online to get a free estimate on a crawl space dehumidifier for your home. 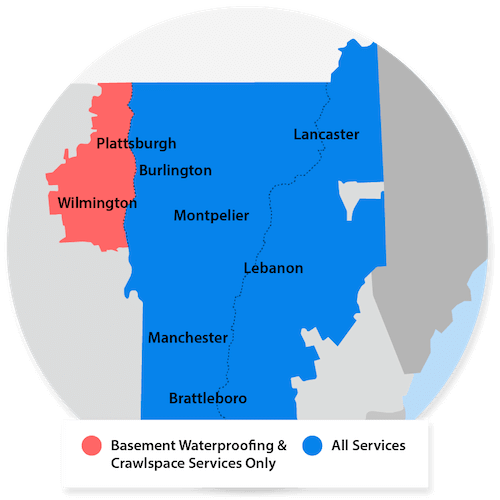 We install all our crawl space products in Colchester, Keene, Burlington, Laconia, Rutland, Bennington, South Burlington, St Albans, Montpelier, Brattleboro and throughout the surrounding areas.